The Franciscan friars seem to have arrived in the area around 1238 at the invitation of some Norman families. The Abbey, built in 1268 by William Delamer, continues to serve its ancient purpose. The friars today serve the spiritual and pastoral needs of the people both locally and beyond the confines of Co. Westmeath. The friars probably came to Multy around 1238 and the friary and church were built around 1270 by a local Norman patron, W. Delamer. The building took many years to complete. 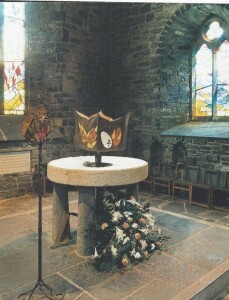 The dedication, to the honour of God and St. Francis, took place in 1306 according to the Delamer memorial in the church. The friary in Multy was mentioned at the General Chapter of the whole Franciscan Order, held in Perpignan, southern France in 1331. Further additions to the church, namely the tower and south transept, were added in 1450. The friars embraced the reform movement, introduced by St. Bernadine of Siena, in 1460. The Irish Province of friars held their Chapter here in 1472 and again in 1527. In 1540 the Abbey was suppressed by order of King Henry VIII. That did not prevent the friars from ministering to the pastoral needs of the people for the next 40 years while living quietly in the neighbourhood, according to a report by a Captain Piers. In 1590 a party of military raided the Abbey and arrested five friars, three of whom died in captivity. Again in 1601, on October 3rd, the eve of St. Francis’ Day, the church and friary were burned; six friars were arrested and incarcerated in the castle of Ballymore, twenty miles away. who once had faithful friends at thy command! In 1604 the friary was again raided and burned. Four friars were captured and two escaped who quickly returned to continue the work of restoration. However, for the next twenty years, raids continued, friars were arrested and imprisoned. This period was described by the friar historian, living at that time, Donagh Mooney, as ‘a theatre of persecution’. Yet, a Provincial Chapter of the friars was held in the friary in 1626 and Brother Micheál Ó Cléirigh, a friar and chief of the Four Masters, visited the friary and copied the Book of Cúchonnacht Ó Dálaigh, a manuscript already five hundred years old. In 1646, a visitor to the Abbey recorded the presence of thirty friars, including novices. However this first half of the 1600s ended tragically when in 1651 ‘the friars of Multyfarnham were all scattered’. The friars all left after the Cromwellian onslaught but continued to live at Knightswood, a mile from the friary, until they were expelled from there in 1698. Religious life went on however as they lived in a thatched cottage, very near the ruined Abbey until around 1830. The church was partially restored in 1827 as we see from the plaque in the south wall of Our Lady’s chapel. Afterwards Fr Anselm Conway, Guardian, built a solid three storey friary in 1839 and the friars returned from the cottage on the western side of the river Gaine, where they had lived for 125 years. The friars opened a Franciscan College to foster vocations to the Order in 1896 and the church was renovated extensively once more. 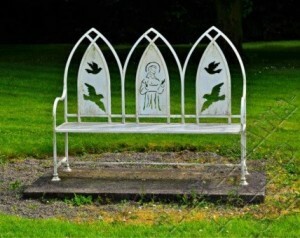 The retired Bishop of Meath, Dr. Gaffney was, at his own request, buried in the Abbey church. 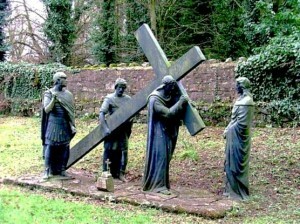 The lovely Way of the Cross was completed on both sides of the river Gaine in the Abbey grounds in 1942. The friary church as we see it now, was newly restored, starting in October 1973, according to its original design and in the light of the liturgical guidelines of the Church during Vatican II. Some ancient monuments from the cemetery nearby were also fixed to the walls within the church at this time. This led to a decision in 1975 to rebuild the ancient choir area or Blessed Sacrament Chapel which we may admire with its special features today. The grounds of the friary are regularly sought out by people in search of solitude and an opportunity to pray with the rather unique Way of the Cross. The more than life-size figures were planned by a previous Guardian of the Abbey, Fr. Camillus Courtney and designed by Neff Brothers of Cork City. Many come ‘to do the Stations’, frequenting this old church as their forebears did long ago, to worship God and in thanksgiving for their Catholic faith, so courageously defended and witnessed to by the friars and the local people over the long years between 1540 and 1829, the year Catholic Emancipation was decreed in the Westminster parliament. Thy holy house shall lonely stand no more”. 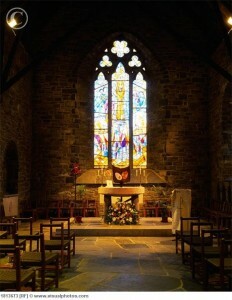 * The central altar and beyond the tower arch, the Blessed Sacrament chapel with the striking stained glass window in the background. 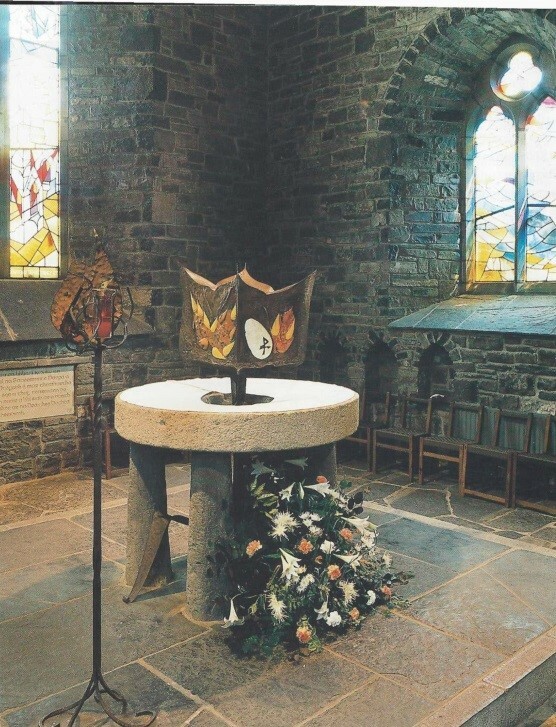 * The tabernacle, focal point of the chapel, represents, in copper, a stalk of wheat with the ripening ear, designed and executed by David King. Surrounding the tabernacle is a millstone from the bank of the river Drowes, used for years to grind corn for the farmers of Sligo, Leitrim and Donegal. The four limestone columns originally belonged to the Nugent family of Donore, always staunch defenders of the friars here. * The stained glass window catches some of the history of the Abbey: the burning of the friary in 1601; a Franciscan priest in brown habit offering Mass in the open, surrounded by the faithful; rays from the Host shine on the friar scribe on the left and the friar preacher on the right. The Spirit shines down on the Eucharistic words: ‘Hoc est Corpus Meum’ – ‘This is My Body’. The window, made from hand-made glass, is the work of David King. * The four windows of the chapel depict the story of the Children of Lir, a story which bridges the transition between the old Celtic religion and the new Christian faith. The story is about the four children of Lir, who were changed into four swans by their cruel step-mother, jealous of their father’s love for his children. According to the legend, the four swans spent 900 years on three waters: Lake Derravaragh close to the friary, the waters between Ireland and Scotland and the waters off Mayo in the Atlantic Ocean. There the children were rescued and baptised by a hermit Macaomhóg off Inis Gluaire, in the bay of Erris. * St. Anthony’s shrine was recently re-designed with a new statue of the saint, executed by Fr. Joe Walsh, ofm who also executed the modern statue of St. Francis. * In the first recess of the Lady Chapel is a traditional Irish image of Mary carved from Nigerian wood by Desmond Warren. The colouring of the statue was done in the classic monastic style of the 14th century by Fergal O’Farrell. * Notice also the four ceramic plaques in the church, honouring St. Francis, St. Clare, St. Oliver Plunkett and the Venerable Matt Talbot, designed and executed by Mrs Chris Kelly.